With its long, warm growing season and snowy winters, Tennessee offers gardeners the chance to experience more than one season of gardening beauty. There are numerous shrubs available for green thumbed Tennesseans. Some are grown for their flowers while others are used as formal evergreen hedging. An airy shrub reaching heights of 70 inches, the strawberry bush (Euonymus americanus) is a native Tennessee perennial. Its blossoms are small, inconspicuous and daisy-like, emerging on stalks directly from the base of the leaf stem. It has a stiff, upright habit that can be pruned into a small tree. The leaves are slightly rounded and lance shaped. Its most promising landscape feature is the fruits it produces. Small and red, they hang from stems like bumpy earbobs. The fruits open up to reveal four shiny, red berries that stay on the plant for some time. The strawberry bush prefers well-drained soils that are rich in organic matter and slightly shady locals. It can be grown in full sun as long as adequate moisture is provided. This plant is poisonous. 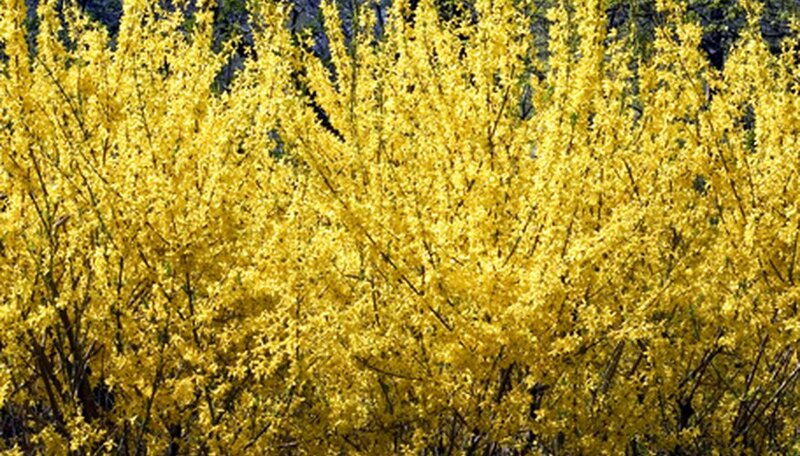 Forsythia is one of the most popular and widely planted flowering shrubs throughout Tennessee. This plant belongs to the olive family. During the spring, it is one of the first plants to bloom, seemingly on fire with bright golden-yellow masses of blossoms. The limbs are arching in habit, giving the plant a delicate appearance. Forsythia thrives in full sun. It prefers well-drained soils that are high in organic matter. Mulching will help to retain moisture. It responds well to pruning and can be shaped to meet more formal garden requirements. Forsythia blooms on new growth, so will not be adversely affected if pruned directly after flowering. Leftover cuttings can be rooted in damp peat moss or sand. Like yellow forsythia, pink forsythia (Abeliophyllum distichum roseum) is a spring blooming perennial shrub. Its pink blossoms are arranged like the common yellow forsythia and it requires the same care. There is also a white blooming variety of this plant. Weigela (Weigela florida) can be found growing throughout the state of Tennessee. This is a medium-sized shrub reaching up to 6 feet in height. Providing well-drained soils with plenty of compost, mulch and water will make weigela grow faster than in poor soils. Full sun brings the most blooms, with a healthy weigela producing large flushes of hundreds to thousands of small, closely arranged flowers. The leaves are 2 to 4 inches long and can be variegated or solid in color. Weigela blooms on the previous season’s wood. Pruning should occur after the plant slows its blooming process, in early to midsummer. Weigela roots and grows quickly from cuttings leftover from pruning. Blue Wisteria: Flower Display Page: Weigela.